Umbilical and waistline Incisional hernias. to a hernia that surrounds the stoma without restricting normal body movement or limiting muscle use. 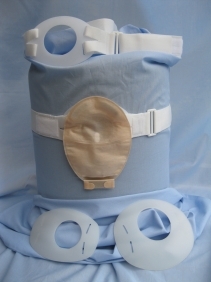 The belt is suitable for all ostomists who have a stoma sited on, or within 3 inches (75mm) of the waistline. Belts are individually made and allow for differences in waist measurement and the type of pouch being used. No specialised measurements or fittings are required when ordering a SASH belt. The belt is made of non-elasticated materials. The 2 inch (50mm) wide webbing is fastened by Velcro and attached to a flexible concave plastic restraining flange. The hole cut into the flange is specifically made for your pouch through which the bag section is pulled through. The plastic slide prevents metal allergies & prevents embarressment at security points whilst travelling. Over the past 20 years we have received many letters of appreciation from ostomists who find the SASH has helped in a variety of different ways. * As a hernia preventative the SASH supports the stoma region against general strains, coughing and unexpected sneezes. * Relief from pain and dull aches in the general area of the stoma. * Eliminates most leakage problems and gives added security and confidence. * Supports the weight of a full bag without fear of pouch detachment. * With support from a SASH belt and periodic consultations with the Surgeon some ostomists are delaying, maybe permanently, the need for hernia surgery. * Ideal for strenuous work environments as well as gardening, housework, DIY, sport and at any time the stomach muscles require firm support against hernia damage. For UK Citizens the belts are available from the NHS with a Doctors Prescription. If you wish to purchase one of the belts, then please see details on the "Order Form" page.